Take a moment to think back to 1998... the average house price was £75,806, the most popular phone was the Nokia 5110 and in September of that year Google was launched. And, on the 23rd of January AbilityNet was born! So, HAPPY 20th BIRTHDAY ABILITYNET! To help commemorate this special occasion we will be celebrating throughout the year at events including the AbilityNet Company Day, Tech4Good and TechShare Pro. We will also be sharing content across all social platforms and our website with #AbilityNet20. Please join in the celebrations by sharing, liking and double tap away to join us as we celebrate the work we do to make the world a more accessible place. 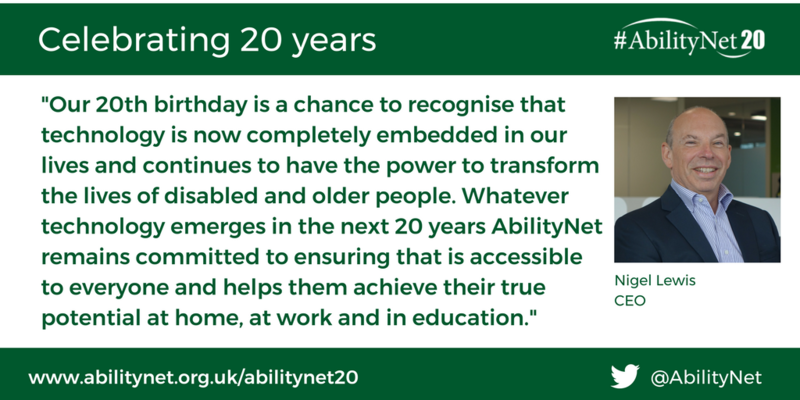 "Our 20th birthday is a chance to recognise that technology is now completely embedded in our lives and continues to have the power to transform the lives of disabled and older people. 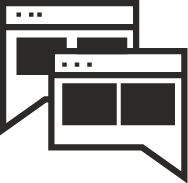 Whatever technology emerges in the next 20 years AbilityNet remains committed to ensuring that is accessible to everyone and helps them achieve their true potential at home, at work and in education." "I'm proud to have been with AbilityNet since the very start. We've seen huge changes in technology in the past 20 years, from desktop PCs to smartphones, from the internet to the internet of things. Like millions of disabled people I wouldn't be in work at all without the power of tech and AbilityNet is always there to help us all get the most from what is available." Read a blog post from Robin on our website titled 'Twenty Years of Tech - and AbilityNet'.